Maybe I would be that guy and attempt to sell you on a quasi-“grown up” version of Scooby-Doo that ditches the one-off mysteries for season-long arcs, but I won’t now. The show has already been canceled, so I’m too late, and statistically speaking, you’re probably too late as well. However, I will at least say that Cartoon Network aired two seasons of Scooby-Doo! Mystery Incorporated, a show that made an excellent case for secular humanism (no, really) while combining pop culture references and actual character development to create the world that Freddy, Daphne, Velma, Shaggy and Scooby always deserved to live in. This is a show where Clark and Ellen Griswold from the Vacation movies and Brenda and Dylan from 90210 were recurring characters, where Udo Kier voiced a homicidal parrot, and where thinly veiled versions of Taylor Lautner and Paula Deen ended up being bad guys that those meddling kids unmasked. I enjoyed this show, and not just because it seemed to take place in a fictionalized version of my old stomping grounds. Cartoon Network is running out the remaining episodes, and they make for something worth watching while I’m doing situps or mindless computer work or what-have-you, and tonight I watched a recently-aired episode where Scooby slips into a dream world. And it just happened to be the dream world from Twin Peaks. 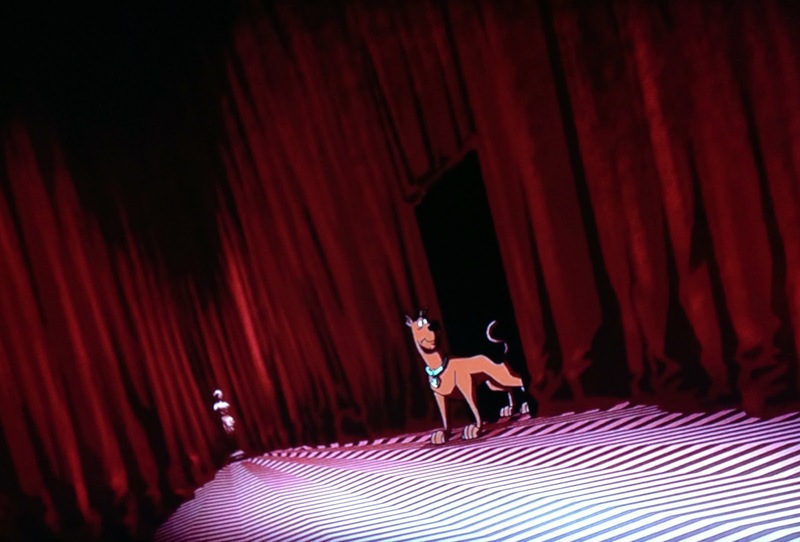 If you must know, it was Scooby’s way of getting information from his little dachshund girlfriend, who has started warning him about Nibiru because been possessed by a spirit that’s voiced by Amy Acker, whose casting could be a reference to Angel, where Acker played Fred, whose body was also possessed by a wise, powerful entity that didn’t have nice things to say. And yes, the Red Room sequence also featured a dancing dwarf who was voiced by Twin Peaks’ resident dancing dwarf, Michael J. Anderson, backwards talking and all. 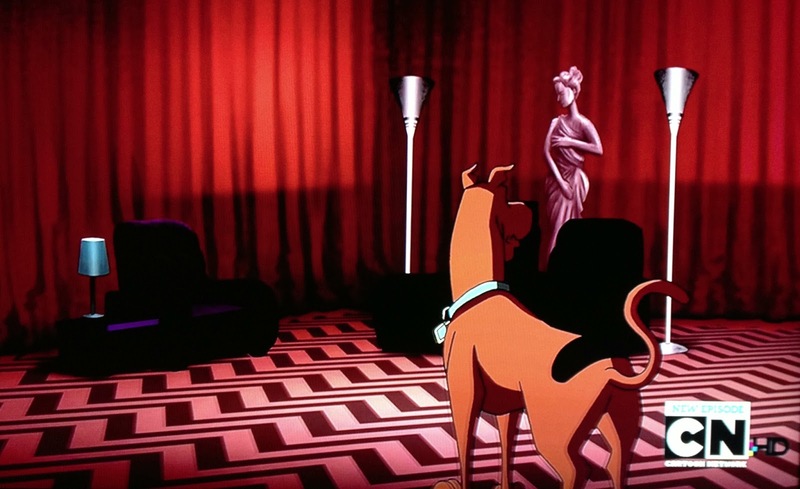 These things make me happy — that Scooby-Doo could exist in the Red Room, just for a moment, if only on a series that kids didn’t get (because “What the hell is Twin Peaks?” asks the nine-year-old Cartoon Network fan who’s only tuning in to watch Adventure Time) and that people my age didn’t watch (because “Isn’t Scooby-Doo for babies and didn’t Freddie Prinze Jr. ruin it?). I’m sure this isn’t the last we’ll see from the original Scooby gang, but I have to assume that future iterations won’t make the mistake of skewing so adult, with “adult” in this context being the kind of legally grown-up weirdo who still watches cartoons. It's wroth noting that the current Cartoon Network (or perhaps Nick, I can never remember) monster-hunting cartoon Gravity Falls featured a restaurant that was decorated like the Red Room. So if nothing else, there are probably at least a couple kids out there wondering what Scooby is doing in that restaurant or why that restaurant looks like the weird room from Scooby-Doo. Also, although I never got a chance to finish it, Mystery Inc was a way better show than it probably had any right to be (though Velma was a huge jerk; definitely a large departure from her cool "Pup Named Scooby-Doo" persona). And it's on Netflix now, so hopefully I'll get to see the rest of it soon. I'm unfamiliar with the show, but I know at least that it's from the guys who did Flapjack. Regardless, I'm happy that Twin Peaks still gets to pop up on kids' shows, making future TV nerds realize several years down the line, "Oh, that's what that episode was about." See also the "Twin Beaks" segment on Sesame Street's "Monsterpiece Theater", from the late 80s. Agent Cookie! Log Lady with talking log! Lynchian nightmare fuel puppets for little kids! You know, I'd never heard of this sketch before. It's awfully bizarre for Sesame Street. Those double-beaked birds would have terrified the younger me. Also, what is the education point of this sketch? That asking questions gets us answers? Or does every Sesame Street sketch not necessarily have a lesson? Actually, I just remembered that there’s a different “Twin Beaks.” It’s an entire episode of Darkwing Duck that starts as a Twin Peaks parody — strummy guitar, corpse wrapped in plastic, weird repetition of the sentence “The cows are not what they seem” — but then devolves into a parody of Invasion of the Body Snatchers. It’s quite the oddity.